Selcuk Iletisim is a “peer-reviewed” journal. It is published biannually in January and July. All responsibility of papers belongs to authors. Citations cannot be made without referencing. 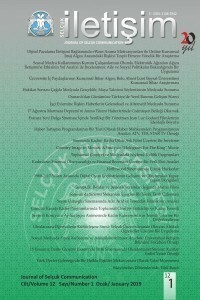 Selcuk Iletisim is in TÜBİTAK/ULAKBİM TR Dizin Sosyal ve Beşeri Bilimler Veri Tabanı, Sobiad, SciLit, ASOS Index, OpenAire database.